As you probably already know, I am a huge fan of the Jersey Shore, and especially love the town of Asbury Park! So, you can imagine my happiness when CNN.com posted its 50 states, 50 spots for 2014 and Asbury Park was one of them! If you haven't checked out Asbury Park, then my question is...what are you waiting for? There are so many great Zagat rated restaurants, cute coffee shops and boutiques. Asbury Park is really happening! 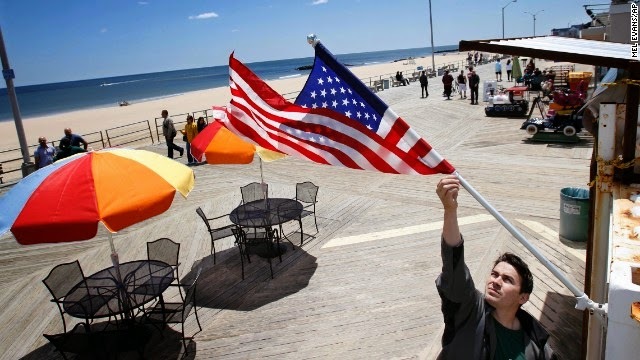 After the devastation of Superstorm Sandy in 2012 and the Seaside Park and Seaside Heights boardwalk fire last year, the communities of the Jersey Shore were determined to rebuild. Head to Asbury Park, made famous by a Bruce Springsteen album, with its famous boardwalk (shown here). It has an incredible Silverball Pinball Museum Arcade (with machines dating to 1931) and plenty to eat.